Ramadan is the most important time of the year in the Islamic calendar, a time when people fast from sunrise to sunset, not even letting a drop of water into their mouth. The dates vary each year, going backwards by about ten days because Muslims follow the lunar calendar. The first day of the fast is announced when the new moon is sighted and the last day when the moon has reached its full cycle after which, there is a period of three days when the whole Muslim world celebrates Eid el-Futr (the feast of breaking the fast). 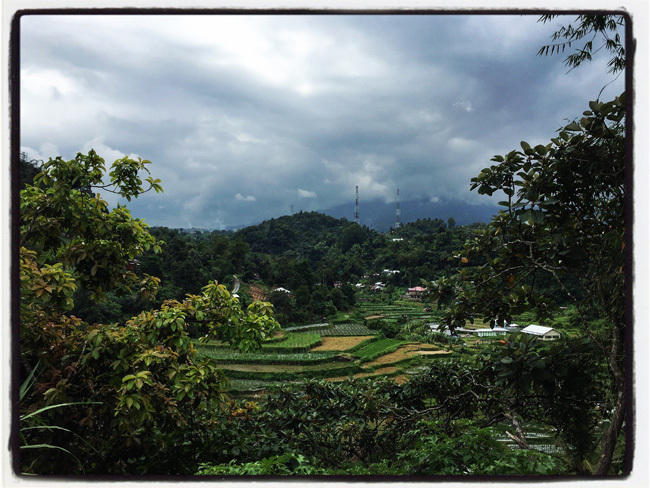 When I planned my trip to Indonesia for the beginning of June, I didn’t quite think of Ramadan but as it happened, the latter half of my stay coincided with the first week of Ramadan, which was both good and not so. Not so good because life slows down during the day, with many eateries closed but good because once the fast is broken at sunset, everything springs back into life, with restaurants putting on special Ramadan menus for those wanting or needing to break their fast (buka puasa as iftar is known out there) outside their home while street vendors wheel out their carts — some with Ramadan specialities which you don’t see the rest of the year. 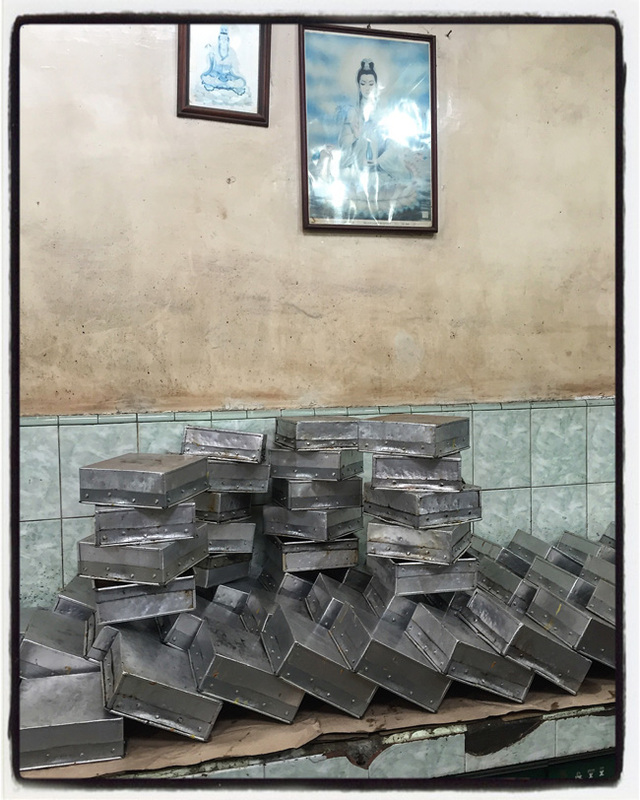 My first Ramadan meal was at Lem Bakrie restaurant in Banda Aceh where everything is cooked over woodfire. 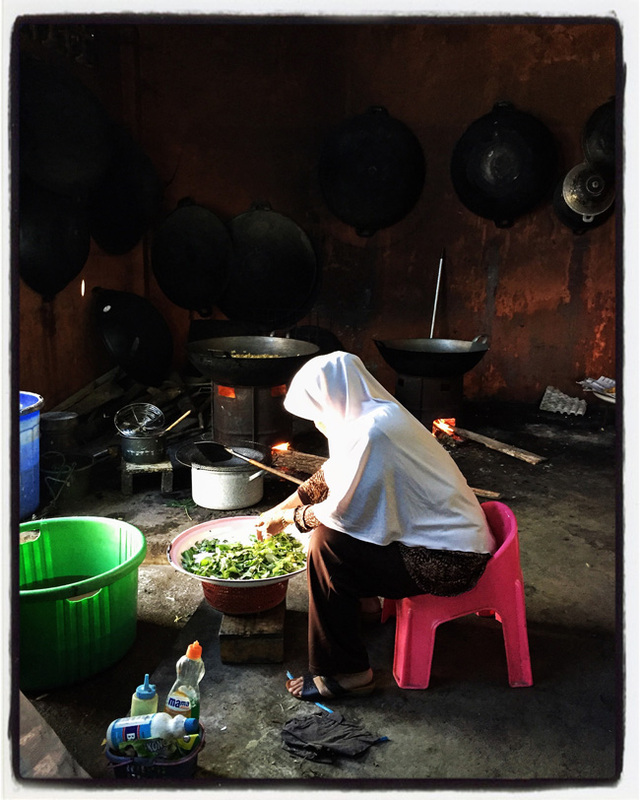 In fact, many home cooks, caterers and eateries in Indonesia cook over woodfire. There was no need to order. They have a fun system during Ramadan where they serve all they have to offer but only charge you for what you eat. You can even taste the sauce of any dish on the table without paying for it as long as you don’t touch the meat or vegetables. 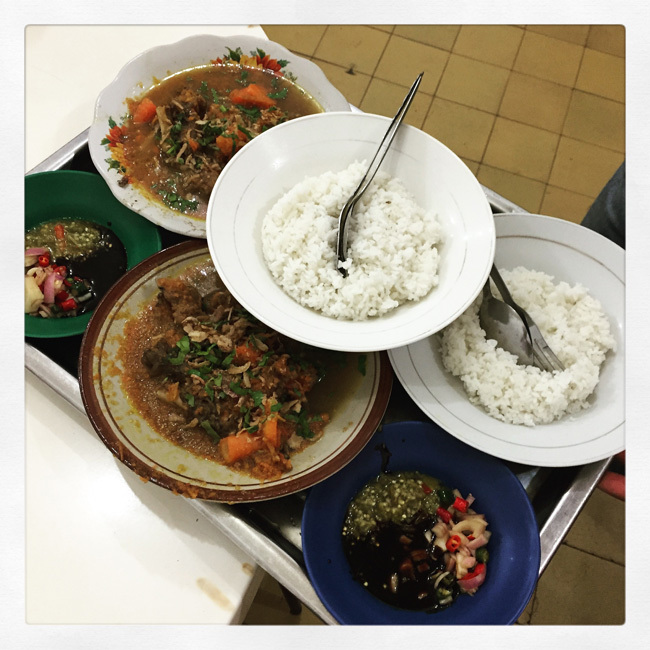 Rice was part of the cover price and was served on the plate — rice is an absolute staple in Indonesia and they can’t imagine a meal without it unless it is noodles — they will give you more if you need it, but will charge for the extra. Lucky I had Mita and Fathur with me. 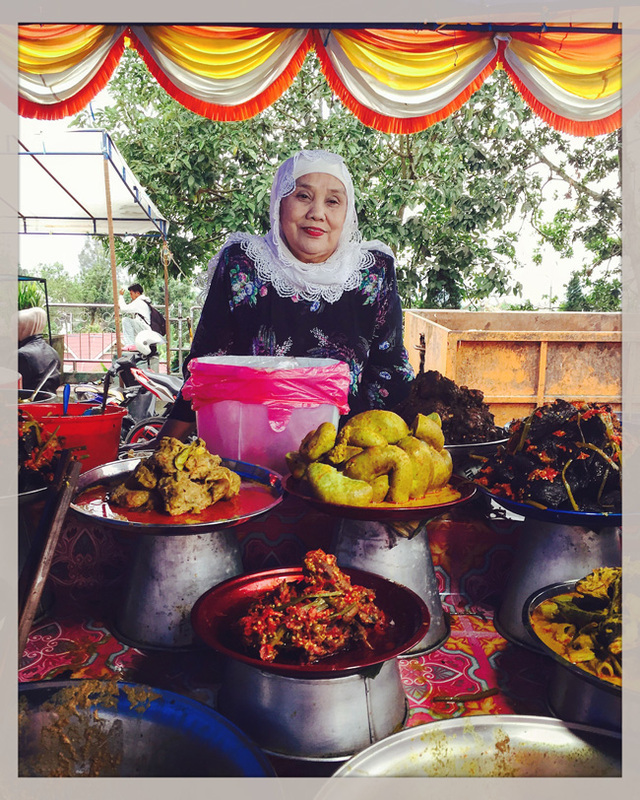 They were my delightful guides in Banda Aceh and they immediately explained the system to me, otherwise I would have tried a little of everything and ended up paying for it all even if I had taken only one bite. 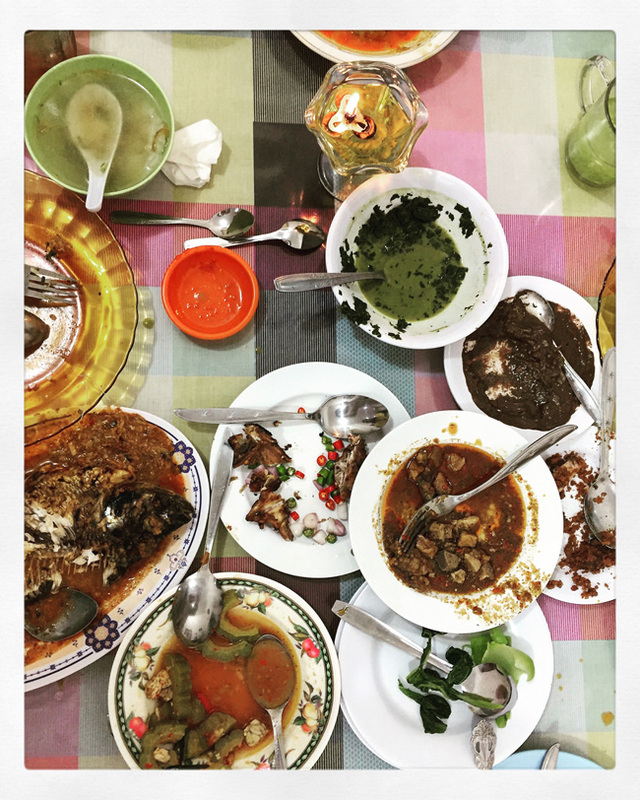 The main dish that evening was goat and breadfruit curry (as seen in the top picture) but we also had fried chicken, beef tendon curry or gulai as it is known in Indonesia, dried seasoned tuna, vegetables cooked with dried fermented coconut, shrimp sambal and so on. We had also brought food we had bought from street vendors such as the biryani on the top right hand of the picture and the noodles to the bottom left of the picture, both served on banana leaf laid on paper and a mixture of sliced daun pegangang and torch ginger flower, more or less in the middle of the picture, again on banana leaf laid on paper. Mita also invited me over to her parents’ house where both her mother and father cater parties for up to 2000 people, and sometimes more. They cook all the food on woodfire in the kitchen pictured above in which Mita’s lovely mother is sorting the assortment of fruit, vegetable and herbs we bought in the market (picture below) for her to make a typical soup that she very kindly served me for lunch even though everyone was fasting. 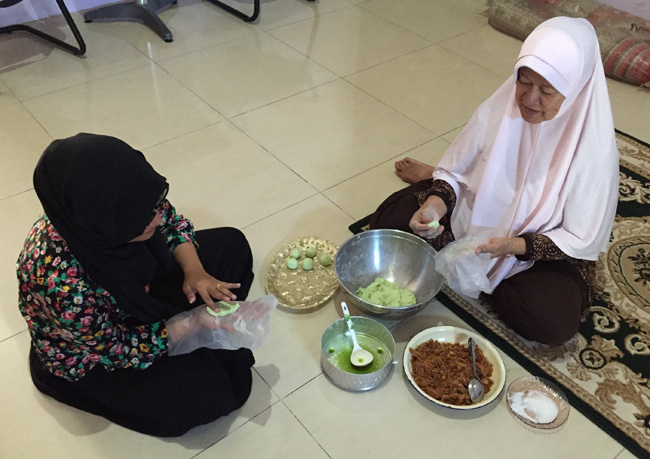 Before the soup, Mita and her mother made me onde onde or klepon. In Indonesia, people always break their fast with something soft and sweet to ease their stomach back into taking in food. 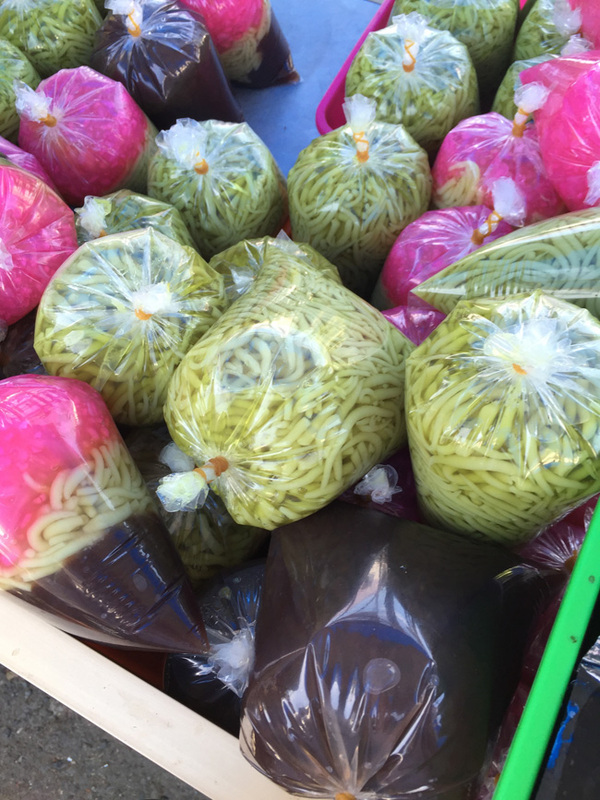 It can be sweet things like onde onde or sweet drinks sold in plastic bags with soft noodles or jelly like cubes inside them. Mita and her mother filling the onde onde dough with palm sugar and rolling each into a ball which Mita boiled and sprinkled with shredded coconut for me to taste. Absolutely delicious! 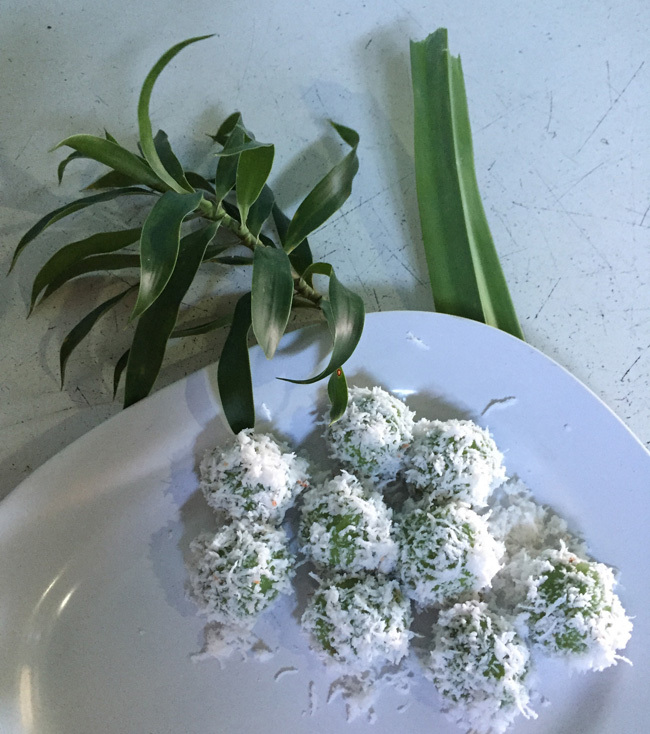 Mita’s mother onde onde with the pandan leaves. The sweet Ramadan drinks with soft noodles inside them. I couldn’t leave Banda Aceh without going into one of their famous coffee houses. Coffee is really big in Indonesia — they are the fourth largest producers in the world — and people like to gather in places in coffee houses where they often also serve food, usually from nearby stalls. In the case of this coffee place, the noodle stand was just outside. You stop there and buy your noodles with whatever accompaniment they have and they send it to your table. I chose crab although I was too tired by the end of the evening, and too full to eat it which was a shame. I just tasted the noodles which were delicious. From Banda Aceh, I went to Padang. The journey wasn’t so straightforward even if Padang was not too far. I had to fly all the way back to Jakarta, to fly back down to Padang. And Garuda, which is normally a great airline changed my flight to a later one making me wait an extra two hours at Jakarta airport. Oh well! Thanks to my wonderful friend William Wongso who helped me with my trip and introduced me to lovely guides everywhere, I had sweet Dian look after me in Padang and we broke the fast together (well, I had eaten during the day but he hadn’t) in a lovely restaurant in Padang where again we feasted on a variety of dishes including Ayam pop (fried chicken) with sambal lado, gulai tunjang (cow foot curry), cassava leaves, tripe curry and of course rice. 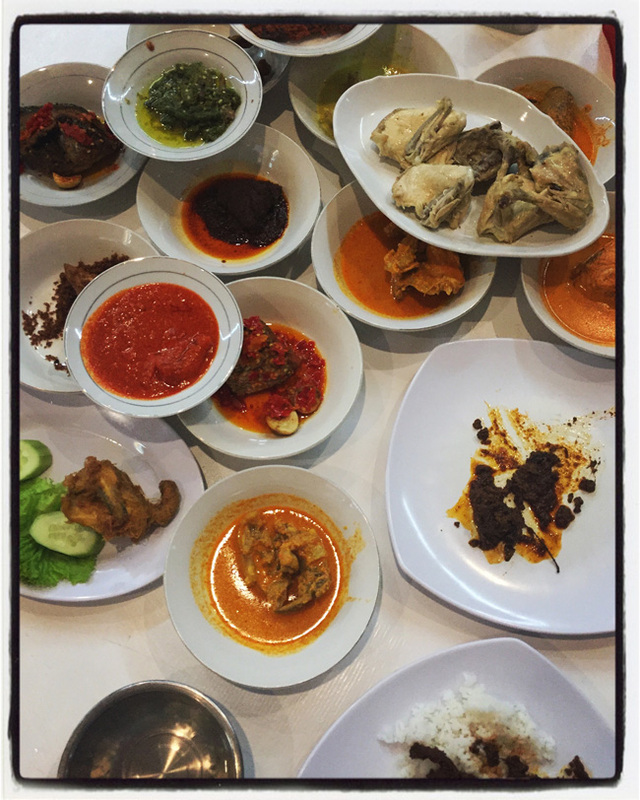 I also tasted Dian’s quail rendang (the messy plate bottom right as I started eating before snapping!). 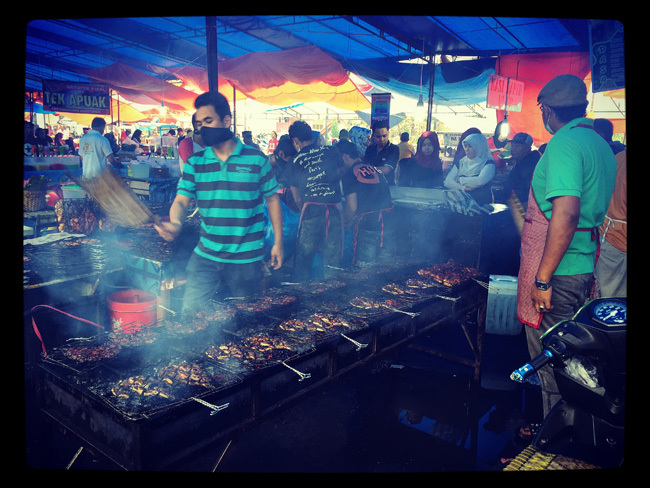 The next day we drove up to Bukittinggi, a lovely town up in the hills where there is a street food market that is absolutely buzzing during Ramadan. 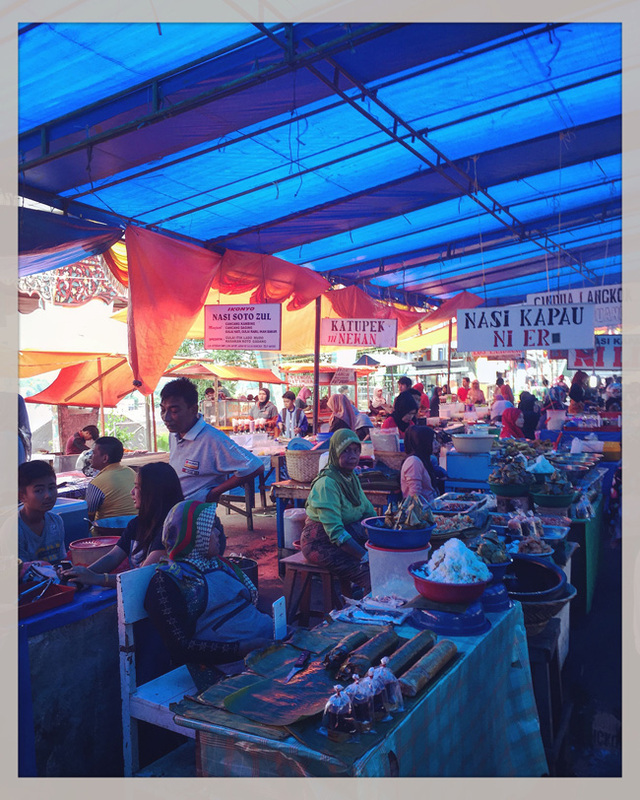 They are famous for nasi kapau, or rice served with a variety of different dishes on the same plate, and most of the stalls had particularly interesting coconut milk and egg sausages (usus isi telur) that don’t look so appetising but are actually quite good. The atmosphere in that market is just fabulous, both for the spectacle of the food and for the people. 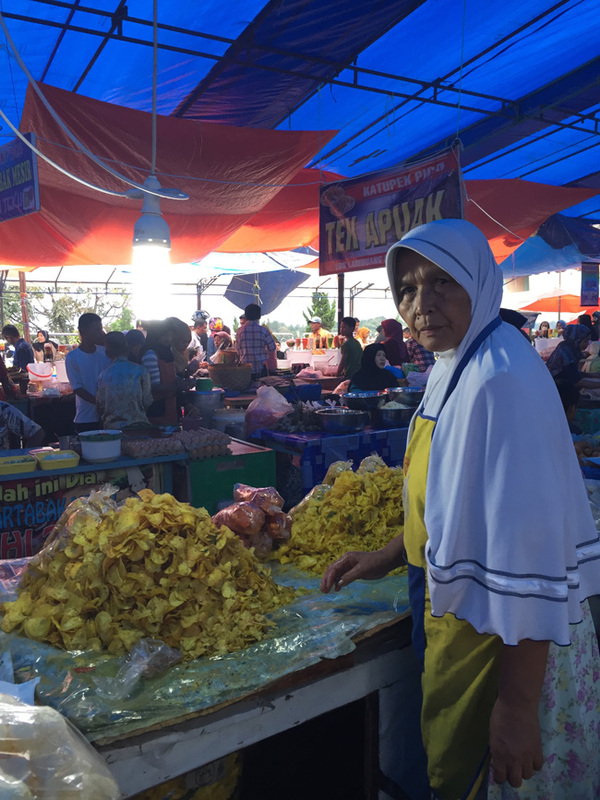 The vendors are almost all great characters like the lady in the picture below whose stall is all about chips which are also a big thing in Indonesia. Most of the meals are served with one kind of chip or another. Some are made with nut-like fruit others are potato chips mixed with a rather spicy sambal seasoning that makes them totally irresistible. 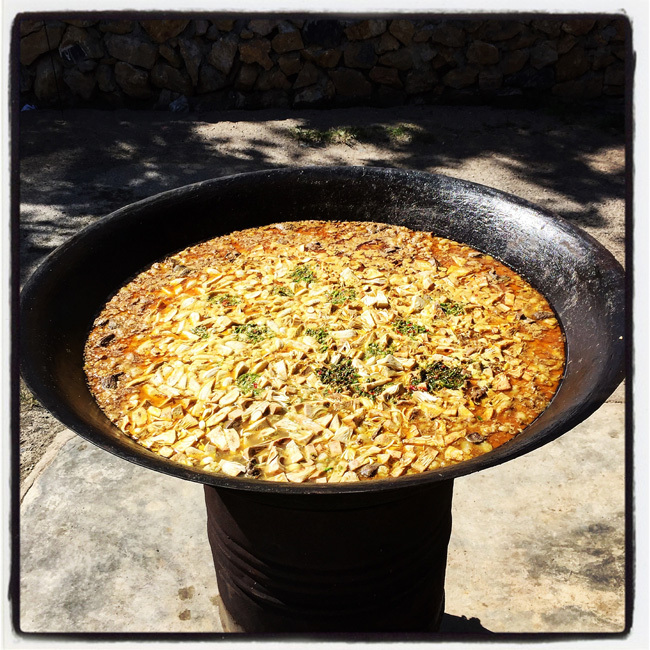 At Mita’s house, her sister in law was frying industrial quantities, all over a wood fire, and her seasoning was just fabulous. I had to convince Mita to give me only a little so that I didn’t get fat eating a huge bag! The lady below had both types, plain and seasoned. And she had different kinds such as those made with melinjo. I also loved the lady below who had a beautiful stall with all kinds of appetising dishes. 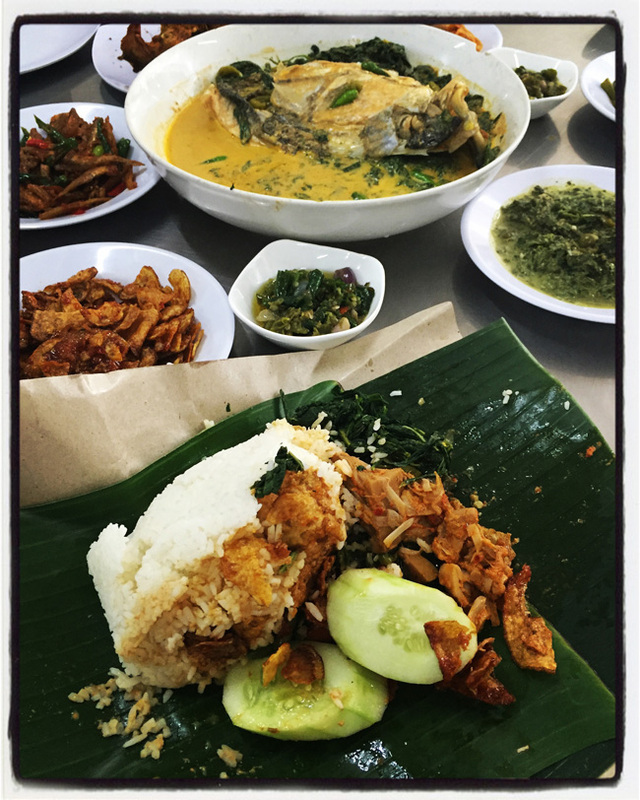 If we hadn’t been going to another buka puasa dinner, I would have stayed there all afternoon and evening tasting everything. In particular, I would have loved to taste the grilled fish in the picture below that were being fanned furiously by two men. It is interesting how in Indonesia many people buy ready-made food for breaking the fast, and they don’t see any shame in it, nor do they worry about the quality which is understandable as most of these stalls have food that is either cooked on the spot in the case of fried or grilled, or cooked by the owner of the stall in their home the way they would cook for their family. The best kind of street food! 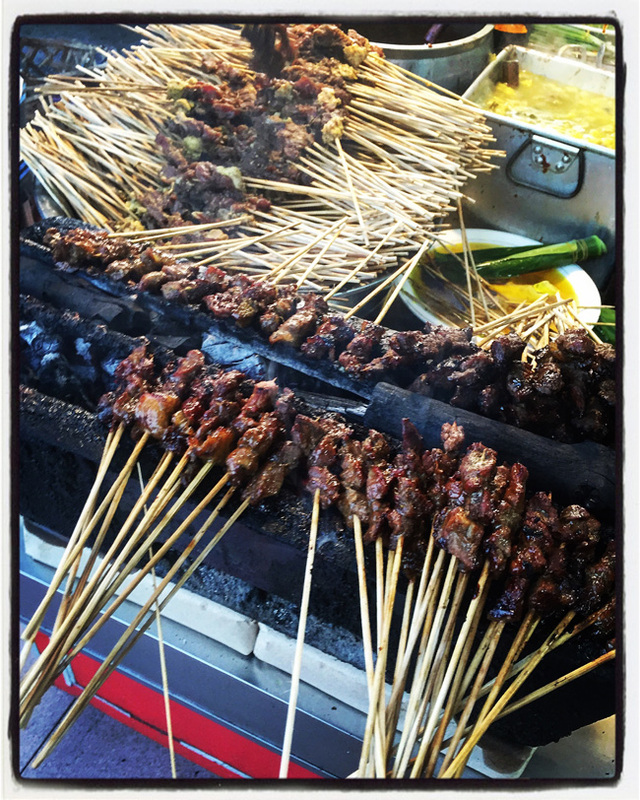 I did taste the sate though and found out that not all sates are served with peanut sauce. Some are served with a soya sauce while others are served with a kind of flour thickened sauce that I didn’t actually like much. 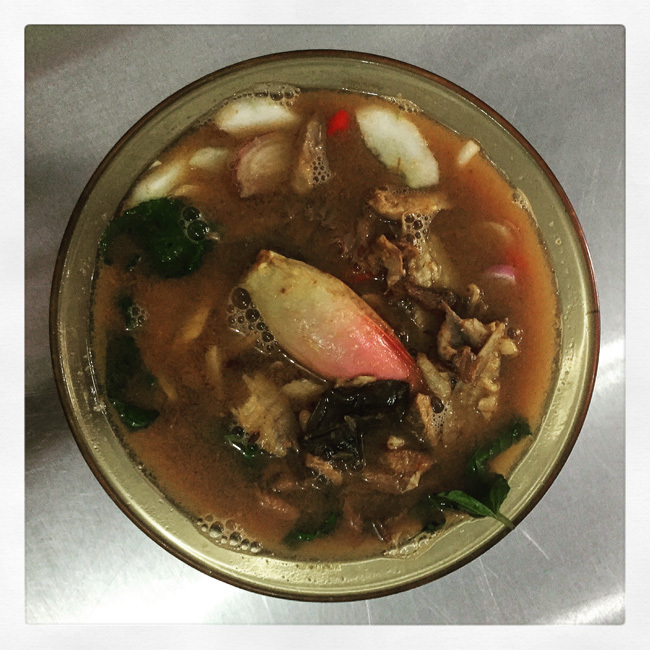 Offal is also big in Indonesia and you see tripe everywhere, as well as chicken feet and sheep’s and goat’s heads. Also beef tendons and feet. I suspect that like us in Lebanon, they have a no waste philosophy and use everything on an animal or on a vegetable, down to the last scrap. 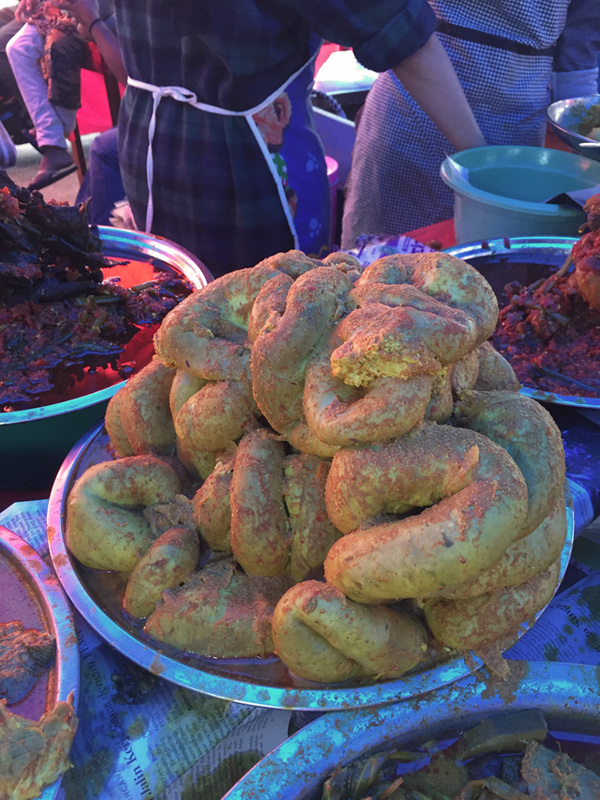 Beautiful tripe curry in Bukittinggi. On the way back to Padang, we stopped at a very large restaurant at the very moment when the sunset was announced by the local Imam. The place was absolutely jam-packed with families, military groups, friends, all breaking their fast. I had eaten a little and more importantly I had had water but poor Dian and the driver had not eaten or drunk anything all day and I hated the idea that they might have to wait until a table became free. Fortunately the owner or manager freed the service table for us and they were able to eat straight away. 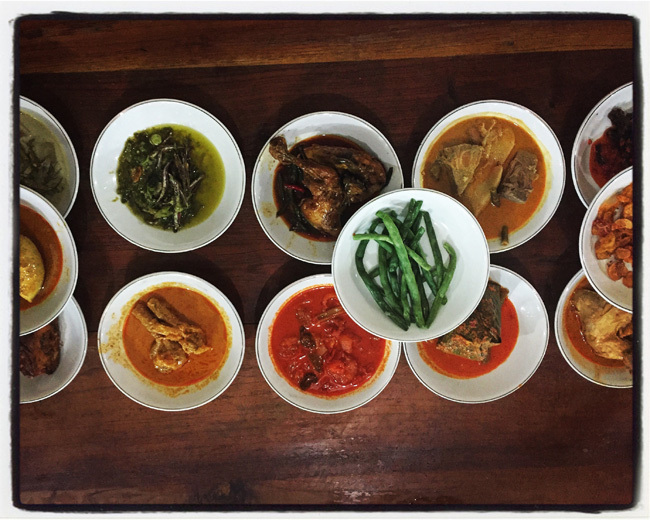 Their buka puasa selection included the duck egg and coconut sausage, tripe, beans, beef tendons, a delicious and intriguing dish of tiny dried fish in a green chilli sauce amongst many other dishes and rice of course. The only food you will see during the day during Ramadan is that sold in markets unless you are in a Chinese quarter where many people are Christian and there you can eat both on the street and in restaurants. Fortunately this was the case in Medan where I had been before Banda Aceh, together with William, and we were able to eat during the day. Lovely Indra was our guide there, together with the Tahari family: Gio, Jamaluddin and Didi their son. 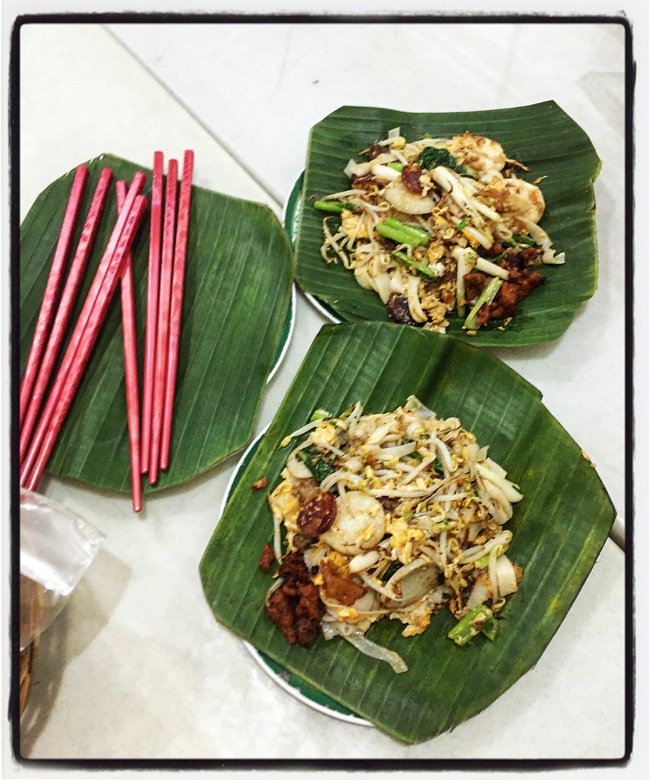 We had two wonderful days of food frenzy tasting everything from beignets to laksa to fish head curry to noodles to rice parcels to intestines sate to martabak to amazing spring rolls. I am only listing a fraction of what we feasted on among much merriment. Bika Ambon cakes cooling upside down in their moulds. 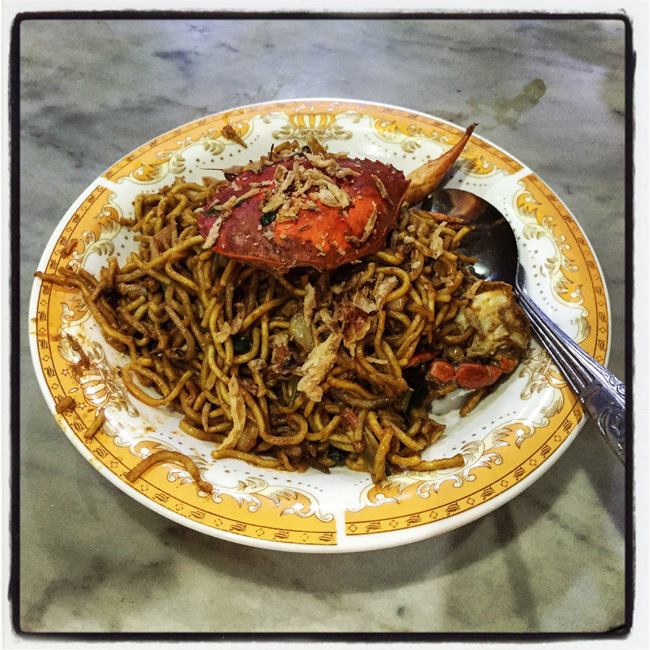 One of my favourite breakfasts in Medan. 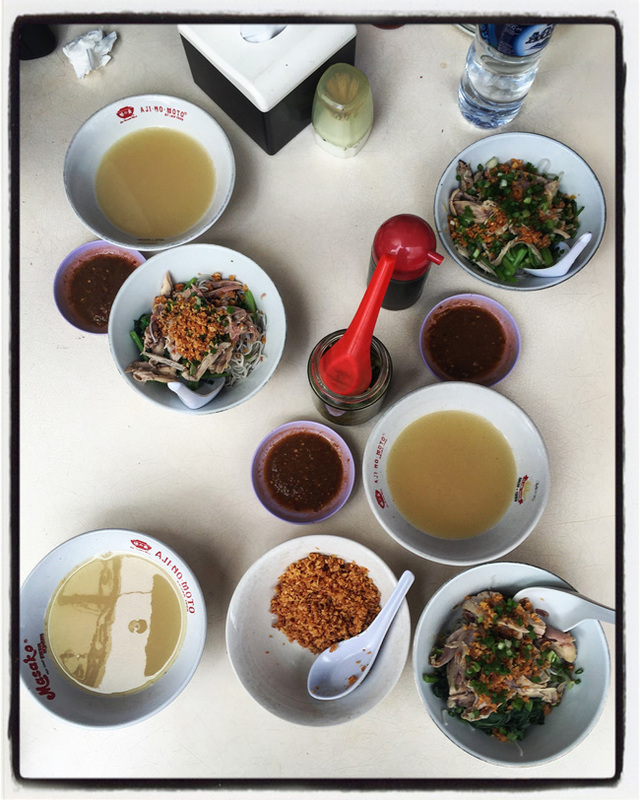 Some things we had bought from street stalls while others like the sate we ordered in the restaurant. I certainly miss these amazingly extravagant savoury breakfasts both in Trapani and London! That was the rice parcel you see in the middle of the picture above which William taught me to eat with a little coarse sugar. Another breakfast, this time a little more restrained but equally hearty. I think I will start an Indonesian street food stall in London. First the food is excellent, and second their wrapping with the banana leaf first then the paper to make a rather beautiful and ecological parcel is the best I have seen until now. 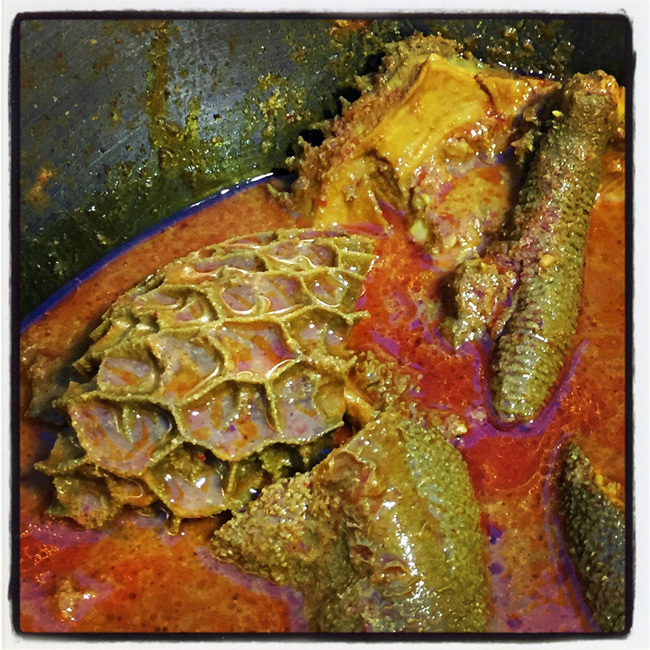 Beyond the rice parcel is a fish head curry. Almost every night we went to a Durian stall because we hadn’t eaten enough and we needed to finish off our meals with some durian! 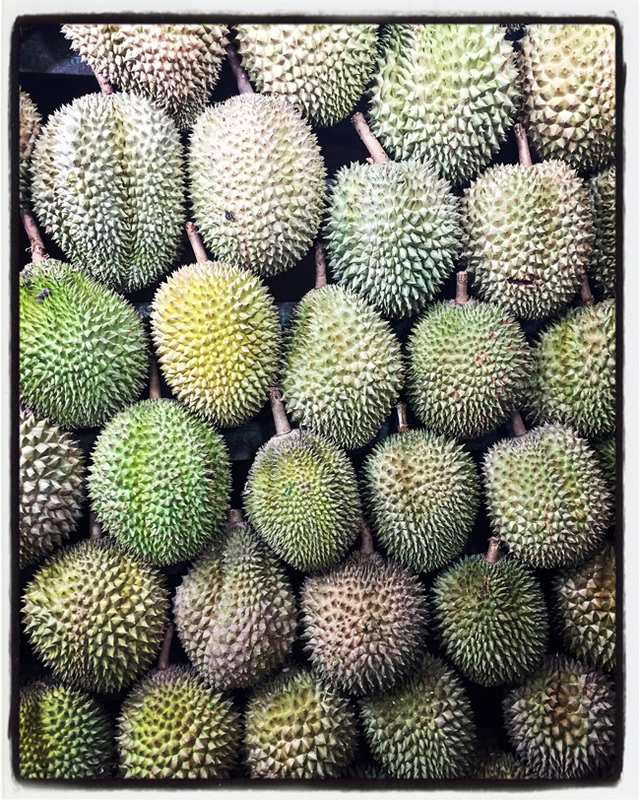 It wasn’t the most famous stall where there is a crush all the time, but one owned by a rather wonderful lady where you can send back the durian if it is not to your taste and have them crack open another one! 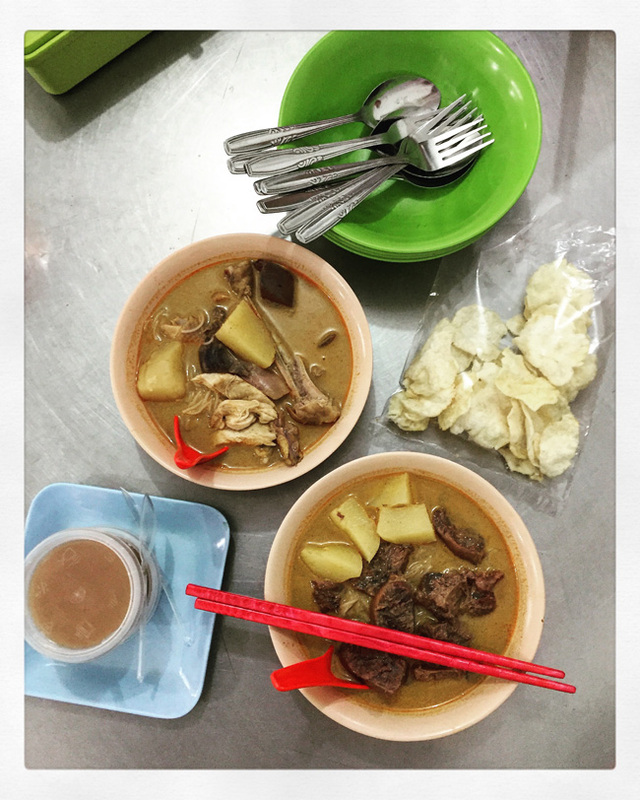 I think this was our last supper in Medan, mutton curry soup. Another noodle breakfast, this time with soup and you add as much of the broth as you want to your noodles. Indra liked his rather dry while William liked it a bit more soupy. In this case, I followed Indra’s example. 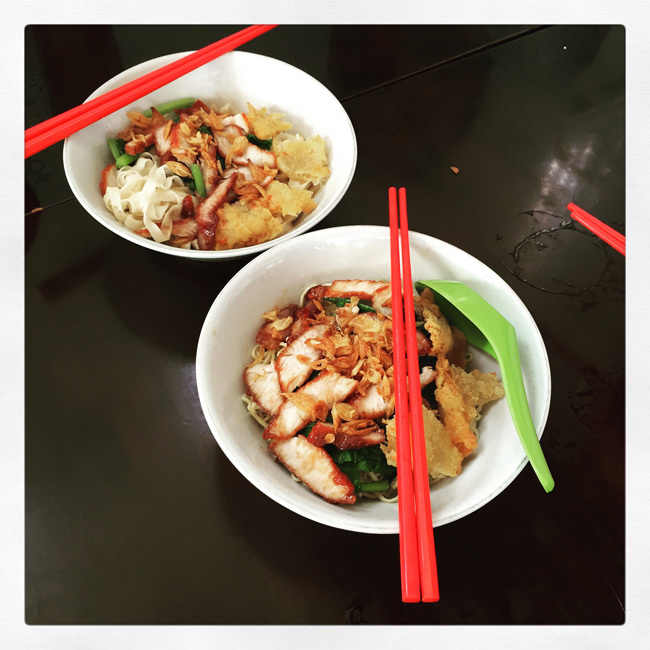 The old lady who served us these noodles was very old and her stall had been there for a hundred years! More noodles although I don’t remember where these were! 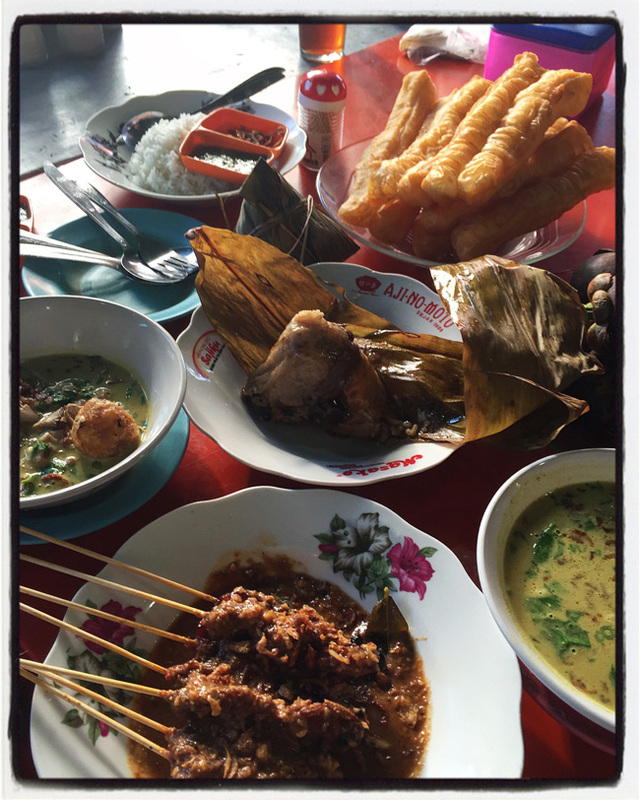 We had had two or more breakfasts before we polished off this amazing Christian Batak lunch! 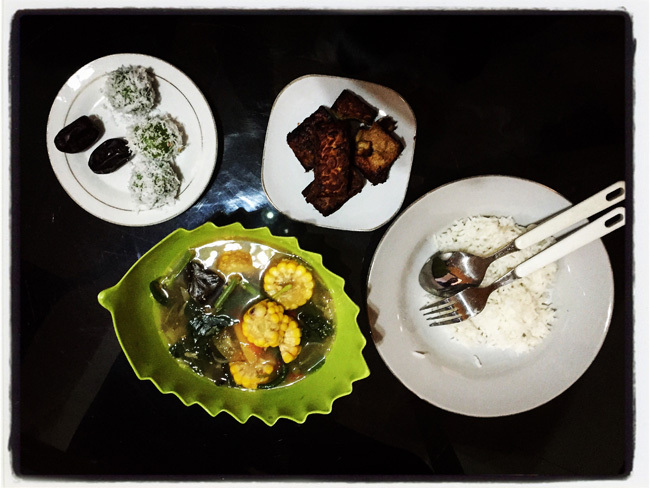 The amazing variety of dishes at Indonesian meals wherever I went was quite unexpected, not that I knew much about Indonesian food. Still, it is such a fun way to eat, and the surprising thing is that I went back after two weeks of non-stop eating having not gained a single kilogram. It must be the fact that they don’t eat bread and don’t use much fat. Laksa with the torch ginger flower floating in it for flavour. 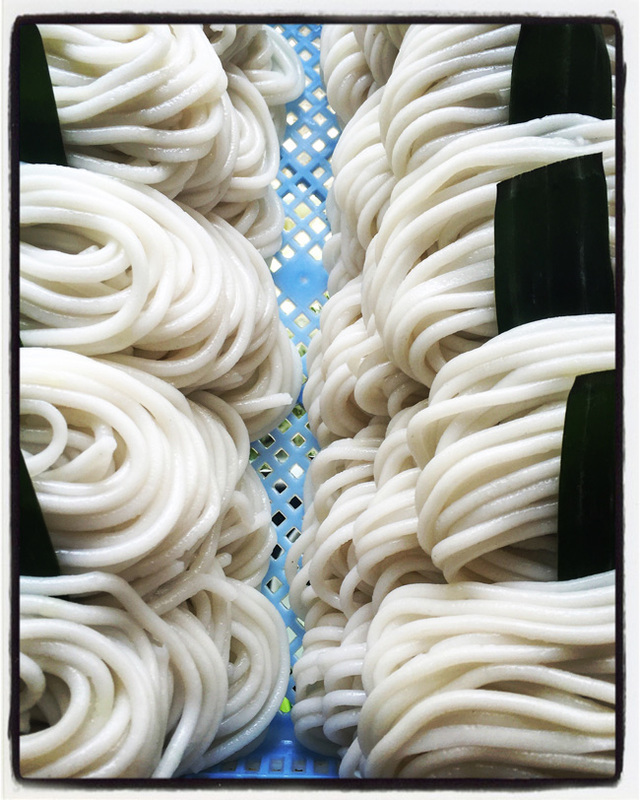 The noodles used in our laksa. 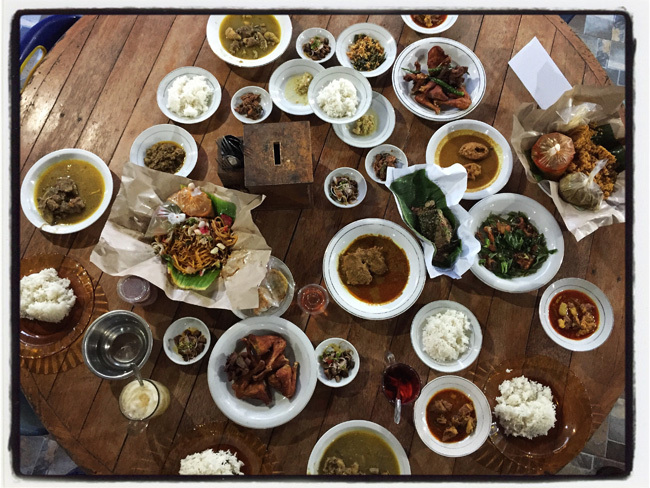 And to produce all these wonderful dishes, you need amazing ingredients which are sold in particularly wonderful Indonesian markets. Luckily they were open during the day in Ramadan. 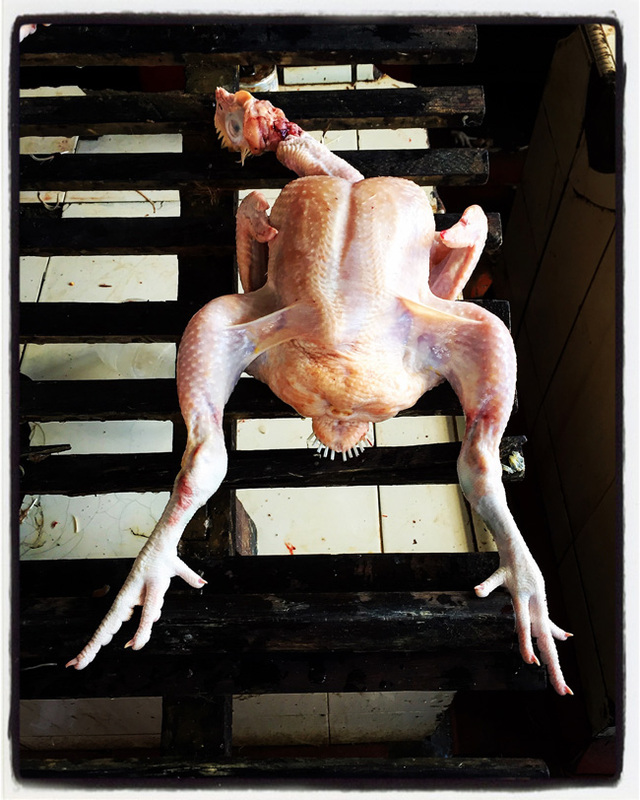 The markets change quite noticeably from one place to the next, not only for the seasonal produce — seasonality and buying local are really big in Indonesia — but also for the way they display chickens for instance. In Ambon, they line them up with their legs sticking up whereas in Padang they splay them like the the one in the picture above. There they also often sell them already skinned, or live to be killed in front of you. 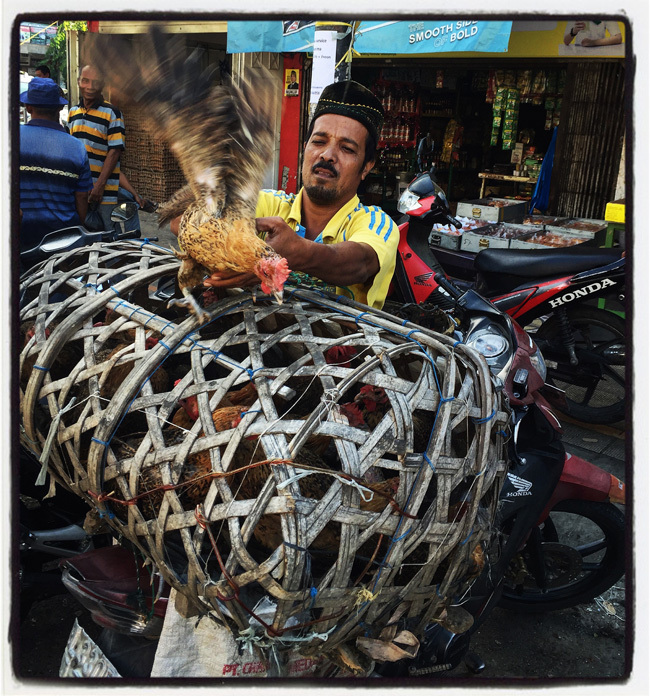 I particularly loved the cages they transport them in as in the picture below! 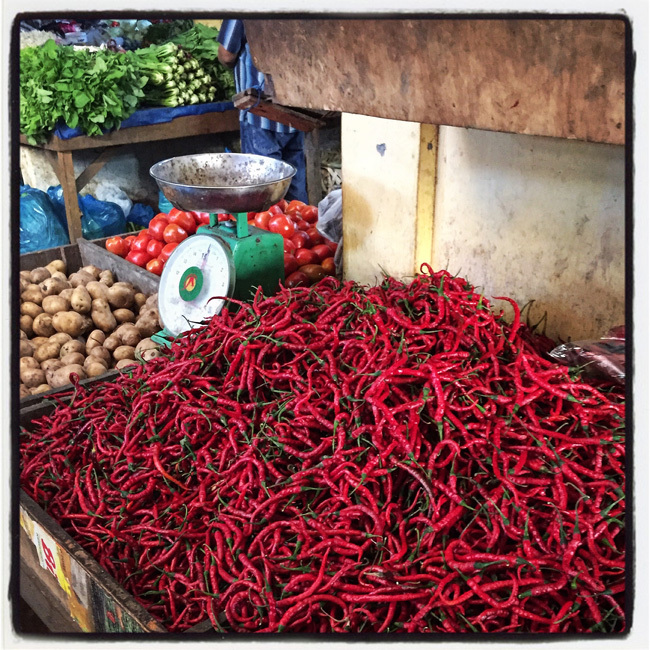 Indonesia is also the country of chillies. 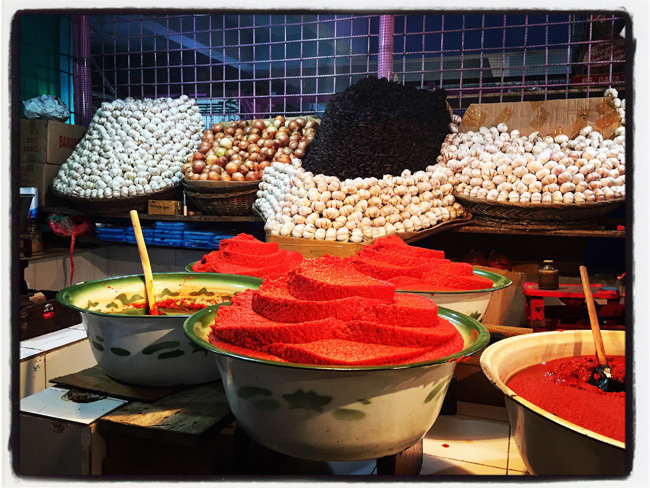 From what I saw, it seems to be used everywhere although in some places more than in others, such as in Padang where the markets had whole sections with just chillies piled up in crates or stuffed in large bags, as well as beautifully displayed chilli pastes like the one below. Those particular red chillies look as if they would be very hot but they are not. And of course there is plenty of fish given that Indonesia is a collection of islands and one way of preserving it is by drying it. 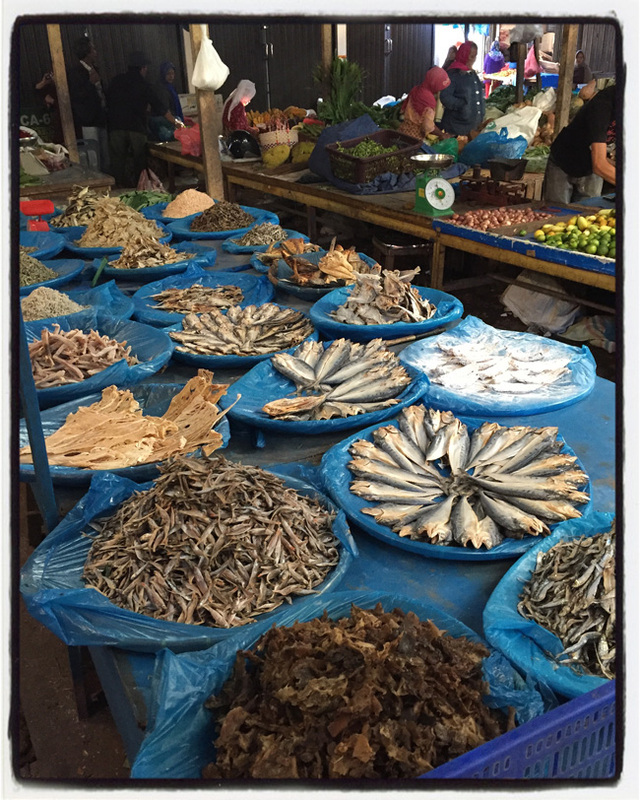 I saw large selections of dried fish in all the markets I went to. 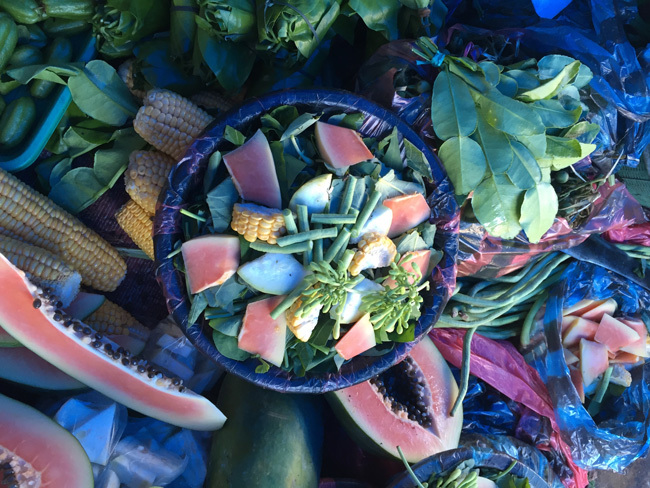 The display below was in a market in Banda Aceh. 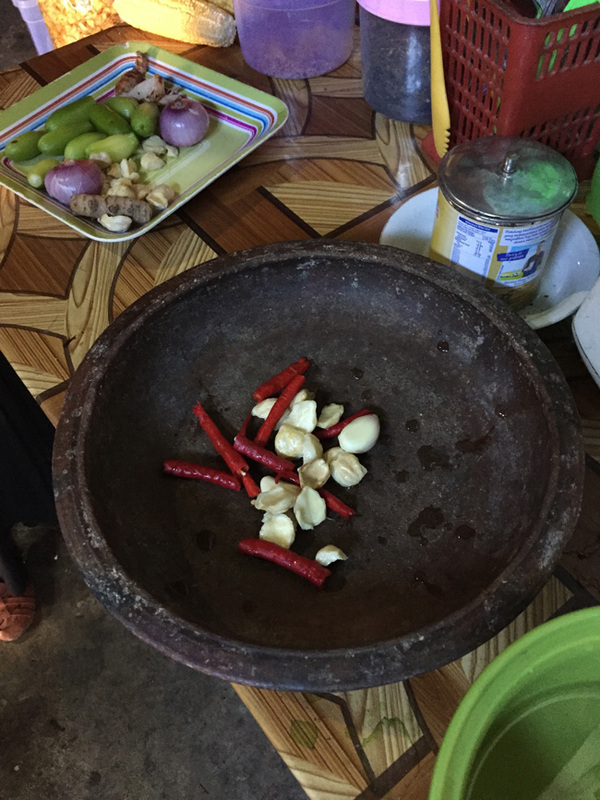 Thanks to William making me a hamper of Indonesian ingredients, and Gio buying me some, I brought back lots of ingredients but the one thing I would have wanted to bring back was a stone mortar and pestle. 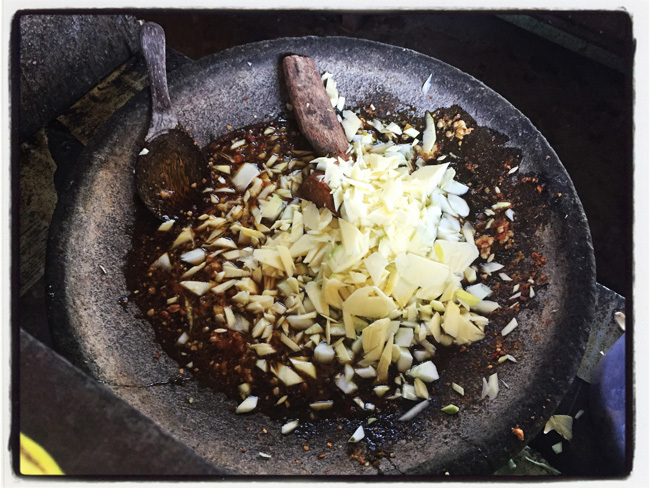 A typical Indonesian technique is to grind everything in a large shallow mortar with either a stone or wooden pestle using a pressing motion rather than a pounding one. 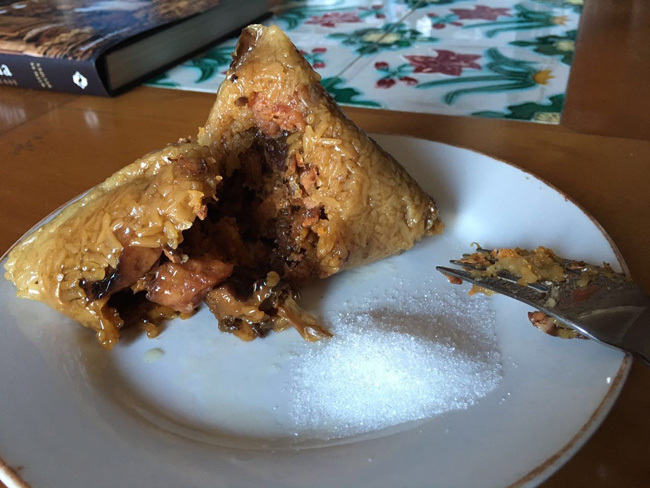 Absolutely mesmerising to watch but unfortunately the stone mortar was too heavy for me to carry together with all the ingredients so it will have to wait until the next time I visit which I hope will be soon as I absolutely adored the country, the people and of course the food!